To the comedian goes the spoils. Write the winning caption for our November 2012 cartoon and be loved and honored by all. Congratulations to Predrag Sunjka for the winning October Caption! Here at Food Processing, we understand how stressful life can be so we're encouraging you to take 5 minutes to add a little fun into your life. Food Funnies is our way of letting you take a break from all the serious stuff you deal with at work — by coming up with appropriate light-hearted captions. Here's how it works: Submit your caption, via email, for the cartoon that appears below. The winning caption will be featured on the FoodProcessing.com Web site, our Facebook page, and in an upcoming FoodProcessing.com eNewsletter. I think the label itself is better for you than the actual food! Honey, I think you carrying it a little too far with the whole nutritional labeling thing. Pass the vitamin A, I can't read the fine print. You are what you eat, or my initials aren't MSG. We have so much to be thankful for ….. and a few things we would rather not know about. Thanksgiving dinner is the most efficient meal of the year. A whole weeks worth of calories, fat, cholesterol, sodium, carbs and sugar in one meal. 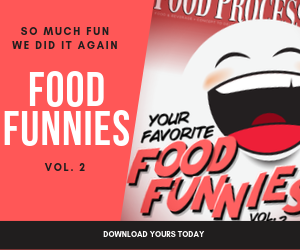 Food Processing's Food Funnies, a monthly feature guaranteed to give you a good laugh.